It’s easy to think that we live in an age of ‘disruption.’ The big digital companies and startups talk about it all the time, because it makes them feel like maverick outsiders even when they’re just feeding off consumers like everybody else. But the underlying truth has always been the same for business: if you don’t change, you die. Even the biggest, brand name companies have had to innovate their way away from the edge of failure at times. Those that didn’t, no longer exist. 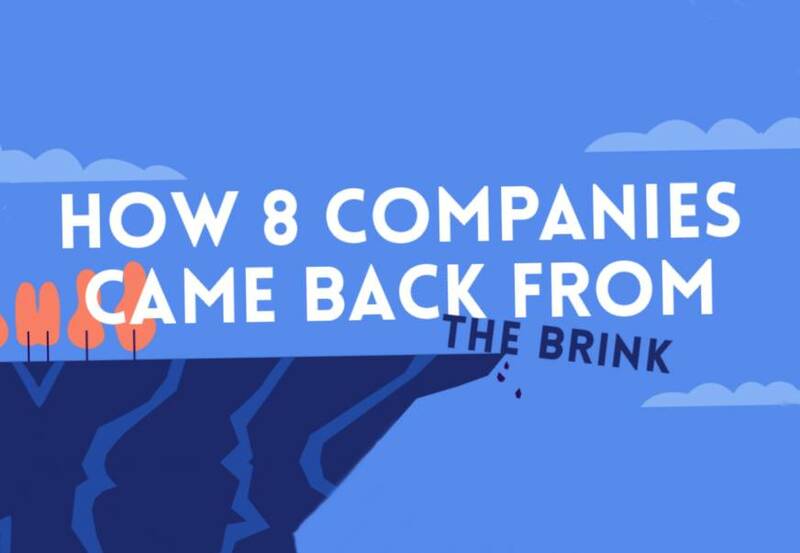 A new infographic from Headway Capital gathers some of the closest calls in business. Here, we’ll take a look at their stories. Who do you call when you need something delivered in a hurry? Even if it ain’t FedEx, their name probably goes through your head. FedEx, like Google or Hoover, has become almost a generic name for sending stuff. It wasn’t always that way. The company got off to a good start in the early 1970s, but soon found that they couldn’t keep up with increasing fuel costs. They had 1,000 packages to deliver each day, but no cash flow to make it happen. In fact, they were just days away from disaster. With a $24,000 bill due after the weekend, founder Frederick Smith ‘innovated’ his way to Vegas with the company’s last five grand. He returned with $27,000, paid his bills, and worked harder to attract investors. Bingo! The world would look like a different place without Apple products and their imitators. But just two decades ago, they were a run of the mill computing company – well, perhaps a bit special, but you hadn’t heard about them unless you used their products. And those products were manifold. They were producing such an array of goods without any real ‘hits’ that Steve Jobs soon spotted insolvency on the horizon. The solution was cold but effective, like their hardware. He fired 3,000 employees and cut the product down to just four items: two desktops and two portables, one each for consumers and pros. It got them out of trouble and it also gave space to innovate. The iPod, iPhone, and iPad were each game-changing innovations that capitalized on the breakthroughs of the iMac and other hits from Apple’s renaissance. Like Apple, Marvel seems ubiquitous these days – too big to fail. Maybe it seemed the same in the late ‘80s, when Ron Perelman bought the company up. But it took less than a decade for him to find the company teetering on the brink of bankruptcy. It was only when Marvel ousted Perelman and set their sights on the movie business that their fortunes turned for the better. And it was a slow process. Marvel had tried for the movie business before, and failed. This time their solution was pure evil, but it worked. They eventually secured a ton of funding from Merrill Lynch and began making the films themselves at unprecedented scale. Giant, expensive movies that have been, so far, too big to fail. The culture was ready for it. But will the culture grow bored of it? 9/11 was the beginning of a very rough patch for Delta. The aviation industry was in disarray and their pilots started to stand up for their rights. Delta filed for bankruptcy in 2005. But rather than dissolve altogether, the airline company – who had begun as a crop-dusting company in the 1920s – took the opportunity to innovate. They picked up on the zeitgeist, and started fixating on customer service. This was the decade when customer service would become everything. They also completely rejigged their focus, adding new destinations and developing their New York operation. And now they’re number one. Everybody loves Nintendo! They’ve been going since 1889, how could they fail now? Well, society is moving faster than ever, and tastes in video games change as fast as folk can develop them. Move too slow or invest in a loser, and it makes a multi-million dollar difference. That’s what happened with Gamecube and Wii-U. Less than half a decade ago, Nintendo faced doom, with $335m annual losses. Then they took two big risks which turned out to be visionary moves: the Switch, and Pokemon GO. Finally, their innovations chimed with the zeitgeist, and Nintendo was saved. Netflix is another of those companies that it’s difficult to imagine struggling. But they invested big in a product that turned out to have a short lifespan – the DVD – and then made some bad decisions when the market drooped. It was a wise idea to convert their existing DVD-by-post customer base into a video-on-demand community. But they weren’t the only ones with that bright idea, and it wasn’t enough. So, like Marvel, they realized they needed to start producing their own ‘content,’ and on a massive scale. It seems a secure option. After home video, DVD, and online, we may find another way to watch stuff – but we’ll always need TV shows. Right? Last decade, LEGO found itself losing business to some of the more modern concerns above – video games, big movies etc. They figured out that they could have their cake and eat it by getting into the movie industry (with Warner Bros) and expanding their toy empire (with Disney). Their movies are now giant toy commercials and the business makes $6bn each year. Now that’s moving with the times. At its height, automobile giant Ford was eating up luxury car brands for breakfast. But their perpetual growth couldn’t last. By the mid-noughties, Ford was forced to sell off its prized captives, like Jaguar, to make ends meet. They remortgaged, restructured, and are looking ahead by investing in electric cars. The only thing that’s certain about the future, in business, is change.